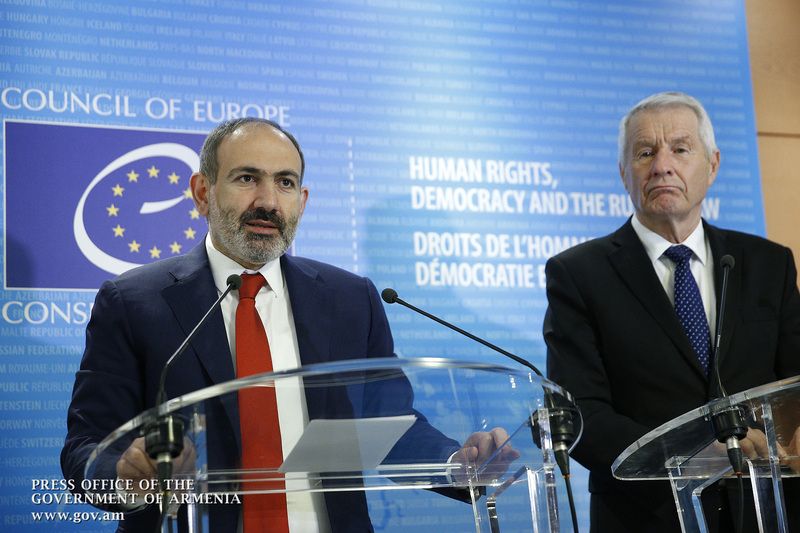 Prime Minister Nikol Pashinyan and Council of Europe Secretary General Thorbjørn Jagland made statements for the media and answered journalists’ questions following their private meeting in Strasbourg. I greet you once again, Mr. Prime Minister. Dear participants, during our meeting, the Prime Minister told us what has happened in Armenia and how a peaceful change of power took place in accordance with the Constitution and the applicable law. We are happy that it really worked. The snap parliamentary elections of last December completed the peaceful transition. I would also like to commend the Prime Minister for his efforts as they are a step forward on this way. We recently approved a new action plan for Armenia. It is a very broad program and we will continue to move ahead at the same pace. It will enable Armenia to move forward and strengthen democracy. The fight against corruption is particularly commendable, and I congratulate you, Prime Minister, for all you have achieved. 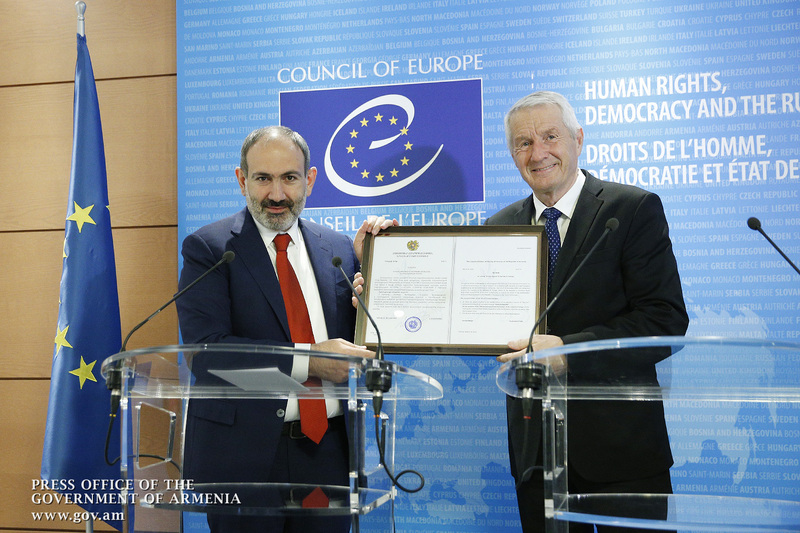 It is an absolute truth that Armenia is a full member of the Council of Europe. Thank you, Mr. Secretary General. Yes, we discussed a wide range of issues and confirmed that Armenia remained committed to European values during the revolution. Very important was the statement that we have carried out a democratic revolution. It was an internal process, and no one, no side has put pressure on Armenia. What happened proves once again that democracy is in the minds and hearts of our people. 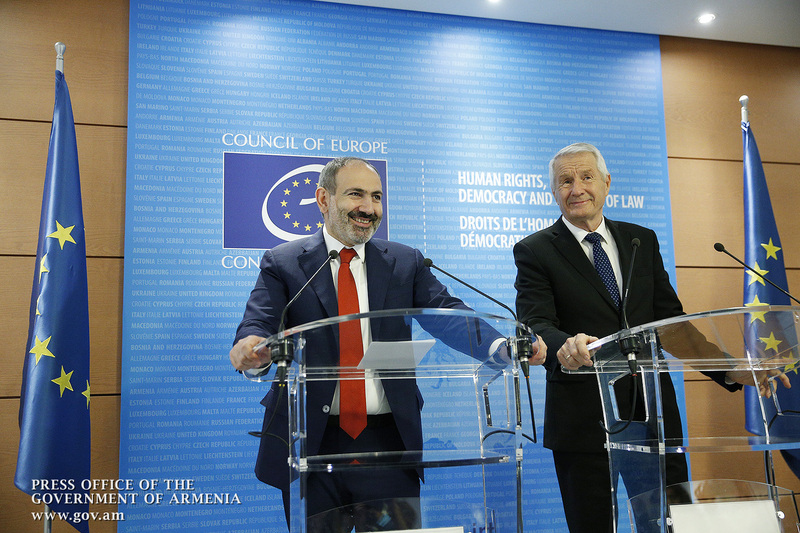 The government of Armenia is committed to democratic values and to a democratic agenda. Also, I wish to say that the Council of Europe’s action plan promotes democratic changes in Armenia. Now we can say with confidence that Armenia has actually become a democratic state. 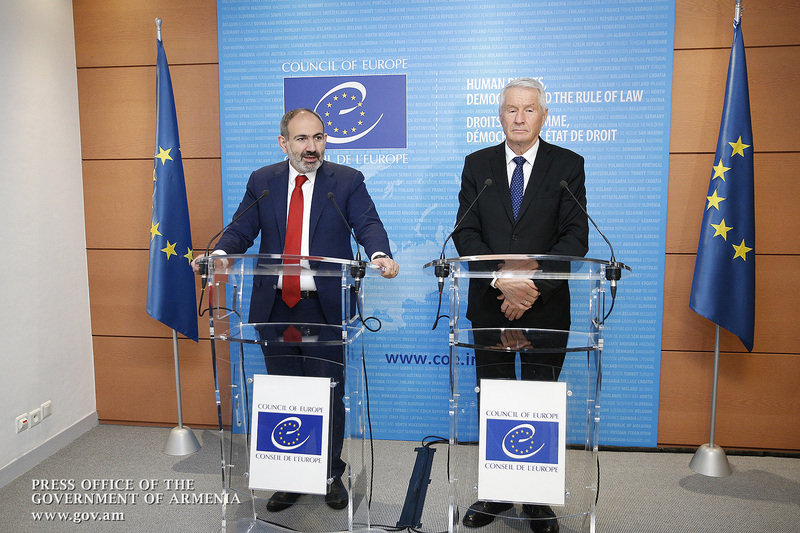 The great experience of the Council of Europe helped us implement democratic changes, establish the rule of law, create an independent judiciary, and implement other key measures. We are fully cooperating with the Council of Europe. Question to Prime Minister Nikol Pashinyan: Do you not see any contradictions between the recent statements made by Defense Minister of the Republic of Armenia David Tonoyan and your own statements? 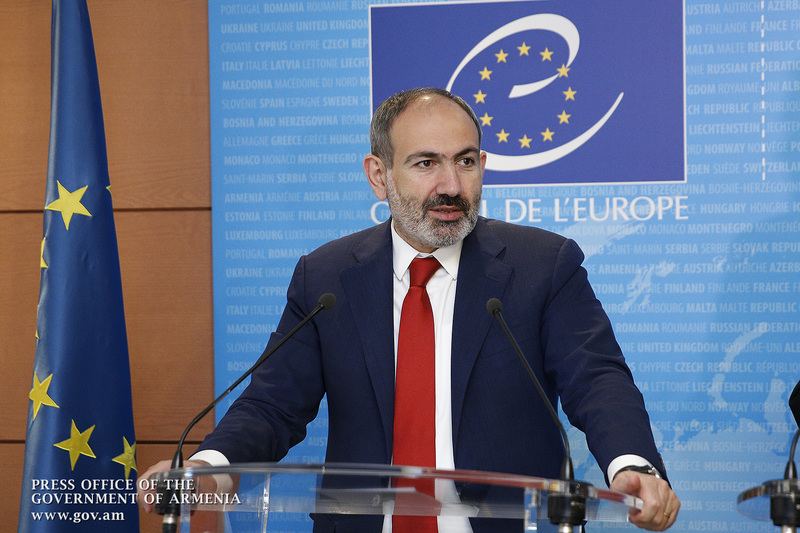 RA Prime Minister Nikol Pashinyan: I do not think there are any contradictions between what I stated and David Tonoyan’s statements. It is a matter of interpretation. Our proposal is to stop the use of force, the threats and the bellicose rhetoric, which Azerbaijan uses concerning the Karabakh problem. We want our societies prepared for peace, and I do hope that our partners in Azerbaijan will do the same. If so, we will have quite a different situation. 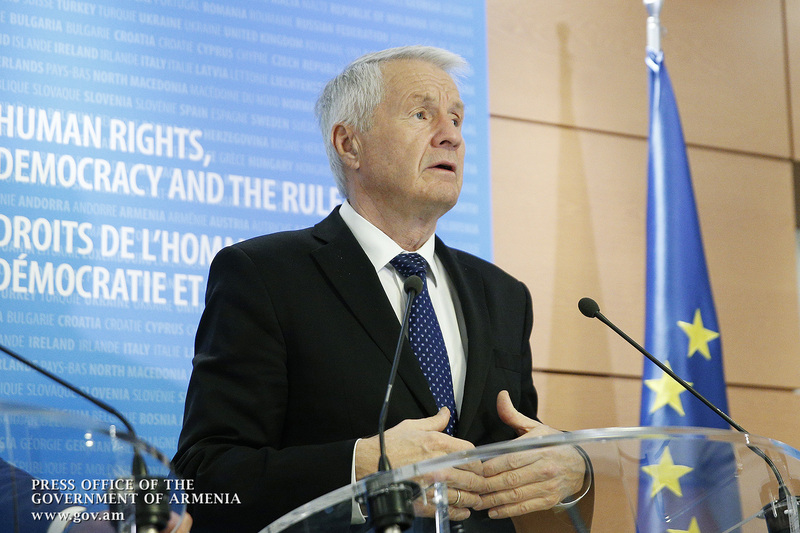 Question to CoE Secretary General Thorbjørn Jagland: Two days ago, the Council of Europe Commissioner for Human Rights stated that it is impossible to visit the “grey zones.” In your opinion, what practical steps can be taken to solve this problem? CoE Secretary General Thorbjørn Jagland: We cannot implement monitoring in such areas because they are not European territories. Nagorno-Karabakh is a grey zone, and my proposal is that the Commissioner for Human Rights be given a mandate and the right to visit these areas. I think it is possible. Political statements need to be made by the European governments to that effect. I am convinced that the Commissioner for Human Rights should have the opportunity to work in a non-political dimension for humanitarian purposes. 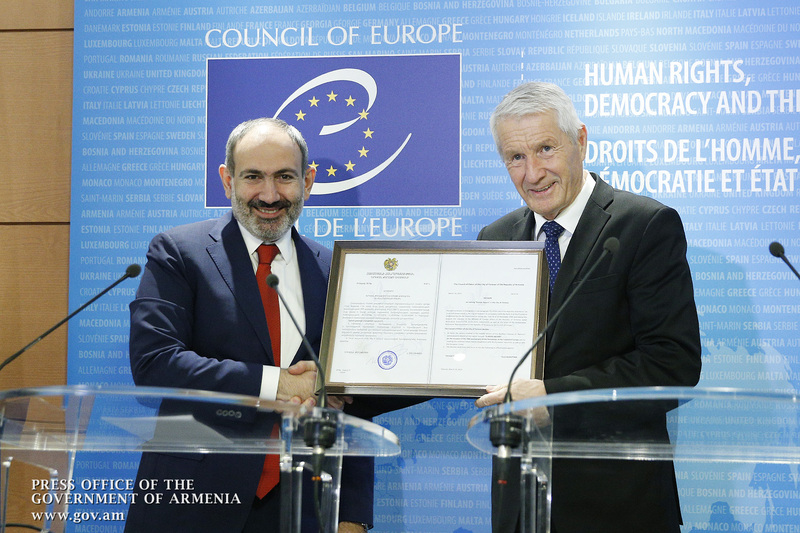 Question to CoE Secretary General Thorbjørn Jagland: Mr. Jagland, do you have any new proposals for Armenia, what do you expect from post-revolutionary Armenia in terms of human rights and democracy? CoE Secretary General Thorbjørn Jagland: We have already seen that the new government has a comprehensive reform agenda, which is very important for us. In particular, we prioritize the judicial reform. The functioning of democratic institutions is also important. It is crucial to see the way the opposition perceives those changes, how the media responds and covers them, including the fight against corruption. Independent media and an independent judiciary are important in this respect. I think this is the agenda of the new government and we will do our best to support it. 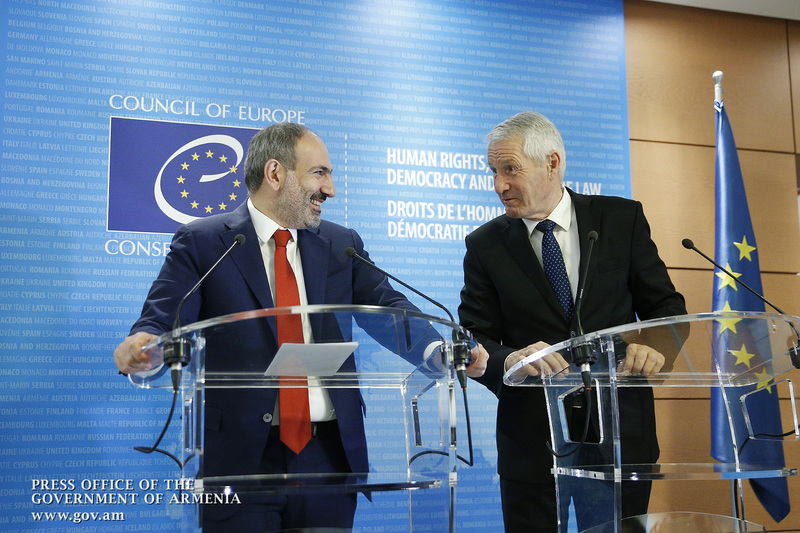 After the joint press conference, the Prime Minister of the Republic of Armenia handed to the Secretary General of the Council of Europe the Government’s decision to rename the square located in the middle part of Yerevan’s Northern Avenue into Europe Square.